In a season where he'll reach a significant personal milestone, veteran Craig Conroy's focus will once again be on team success, not his own. Sitting just nine games away from 1,000 (a milestone recognized by the NHLPA) for his National Hockey League career, Conroy, who was selected 123rd overall in the 1990 NHL Entry Draft by the Montreal Canadiens, has never been the type to dwell on personal accomplishments. Instead, the 39-year-old, who signed a one-year contract with the Calgary Flames, prefers to equate success with how the team fares. It's a trait that hasn't changed since his collegiate hockey days, a solid four-year career at Clarkson University of the NCAA. "He was a very humble young man when he arrived at Clarkson," said long-time Golden Knights head coach George Roll, of the centreman who recorded eight goals and 29 points in his first collegiate campaign. "He struggled a little bit in his freshman year, as many kids do, but he was the type of guy you just had to let play the game. He had so much natural ability. We just gave him the green light to do what he wanted offensively." Conroy repaid that loyalty with consistently strong performances, ones for which he was recognized at Clarkson and beyond. "In his senior year, he was arguably the best player in the country and in our opinion, he was," offered Roll, of the 1993-94 campaign, where Conroy had 26 tallies and 66 points in just 34 games. "He was a finalist for the Hobey Baker Award (top U.S. collegiate player). We really felt like he deserved it." The native New Yorker made a major impact in the community, an ideal ambassador, an athlete who was never asked to lend a hand, but always did. "He's just one of those guys that hasn't changed in spite of all that's happened to him," praised Roll. "He's the same person he always was. He came here a humble kid, who did so much for the school and was great with kids. I can't say enough about him as a player and even more so as a person. He was great to be around and he was awesome in his four years here. He's a special guy." Conroy, who will be entering his 15th NHL campaign in 2010-11, has registered 180 goals and 360 assists for 540 points. 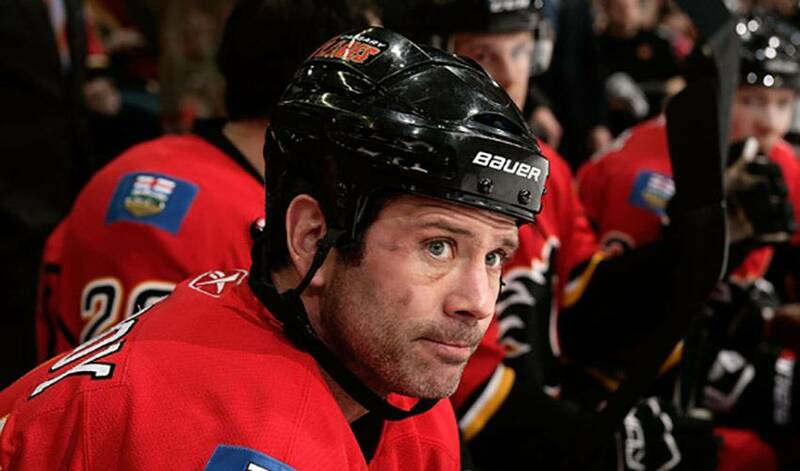 The former Flames captain, will continue his second tour of duty with Calgary after spending four seasons with the Flames (2000-2004) which was highlighted by winning the Western Conference crown in 2004 where he finished second in team playoff scoring with 17 points. He signed as free agent with Los Angeles in 2004, playing three years in California. On January 29, 2007, Conroy was traded back to the Flames by the Kings for Jamie Lundmark, a fourth-round choice in the 2007 NHL Entry Draft and a second-round draft choice in the 2008 NHL Entry Draft. On the following day, Conroy played his first game in three years with the Flames. The game was against his former team; the Kings. Conroy scored two goals and an assist. He was also named the game's second star. Conroy notched his 500th point on January 3, 2009, with an assist on Todd Bertuzzi's game-winning goal against the Nashville Predators with 23 seconds left in the third period, a game the Flames went on to win 3-2. An avid supporter of the Calgary community, Conroy was the recipient of the 2010 Ralph T. Scurfield Humanitarian Award. The Scurfield Award is presented each year to the Flames player who best exemplifies the qualities of perseverance, determination and leadership on the ice, combined with dedication to community service. He was also honoured with the 2009 J.R. McCaig Award that is presented annually to a player and staff member who best exemplify virtues of respect, courtesy and compassion for all individuals in professional and everyday life. It is, in many ways, an award tailor-made for a player whose bottom line remains unchanged.